Past event description. . . 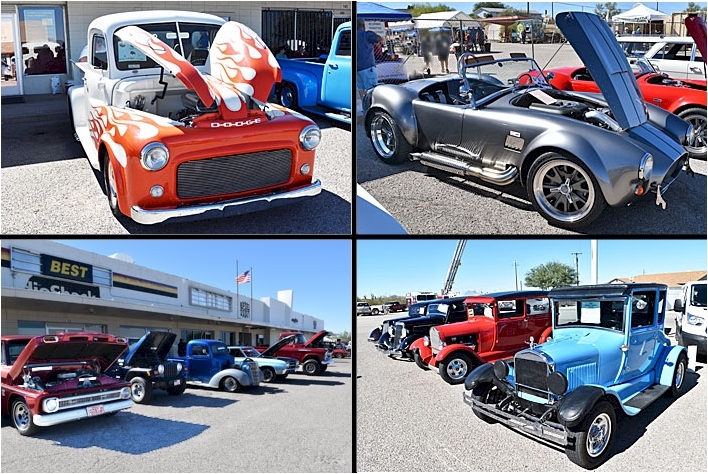 The car show includes a festival with singer-guitarists, a mariachi singer and folklorico dancers. There are food vendors and booths as well as games, crafts and a puppet show for kids. 50/50 raffle. Skills USA Automotive, Welding, Construction, Woodworking, and Digital Photography, San Manuel High School Chapter, will display their skills with scale slot car drag racing track cars and model car show. Spectators enter free. Car registration is at 9am. Entry fees: 1st car is $20 and $10 for your 2nd. A t-shirt & goody bag is given to each person upon entering the 1st car. There will be 14 classes of vehicles, with awards going to the top two in each class as well as 1 Best Paint, 1 Best Interior and 1 Best of Show. Awards are presented at 2pm. You can download the entry form below, fill it out and bring along. 10’x10′ Space. $40.00 for vendors selling merchandise or food • $20.00 for a non-profit selling merchandise or food • $10.00 for a booth for passing out information only.